Children are happier, healthier and smarter when they connect with nature! Encouraging youngsters to fish, hike, camp, hunt and watch wildlife helps to create future generations of outdoor enthusiasts who care about our natural resources! We are working hard to provide opportunities for parents and kids to learn skills to help them become comfortable and competent in the outdoors. Please take a look at what we have to offer the children and youth in our state and take advantage of these great opportunities. 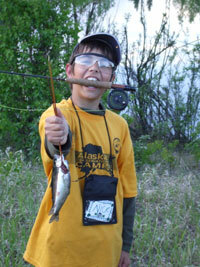 Alaska Conservation Camp (Fairbanks): Focuses on hunting, fishing, conservation and related outdoor skills. Basic camp for ages 11-14, Advanced camp for ages 12-16. Outdoor Youth Days (Anchorage): Focuses on firearms safety, shooting sports, fishing and outdoor skills. For ages 10-14. Camp Habitat (Fairbanks): Nature education and ecology camps at Creamer's Migratory Waterfowl Refuge for ages 4-11. Why you and your children need to get outdoors! It is difficult to overstate the importance of getting kids outside and spending time in nature. Spurred by Richard Louv’s groundbreaking book, Last Child in the Woods, Saving our Children from Nature Deficit Disorder, there is a growing movement within our country to reconnect kids with nature and for good reason. Children and youth are increasingly disconnected from the natural world. This is a worldwide phenomenon. It affects urban, suburban, and rural youth in many nations. It has serious implications worldwide for the conservation field, sustainability, the future of natural resources and the health of the earth itself. Children are spending 40 to 65 hours a week attached to electronic media. Childhood obesity has increased from 4% in the 1960s to 20% today. One in ten children in Alaska is obese. Attention-deficit disorder, hypertension and diabetes in children are considered epidemic. Children have less time for unstructured, creative play in the outdoors than ever before in human history. The outcomes of children’s disconnect from nature are alarming. The good news is that we can change this by encouraging kids to get outdoors! Happier: increases self esteem, improves psychological health and reduces stress. Children learn self-discipline and are more cooperative. Healthier: improves physical conditioning and reduces obesity. Smarter: stimulates creativity and improves problem solving. Children do better in school.